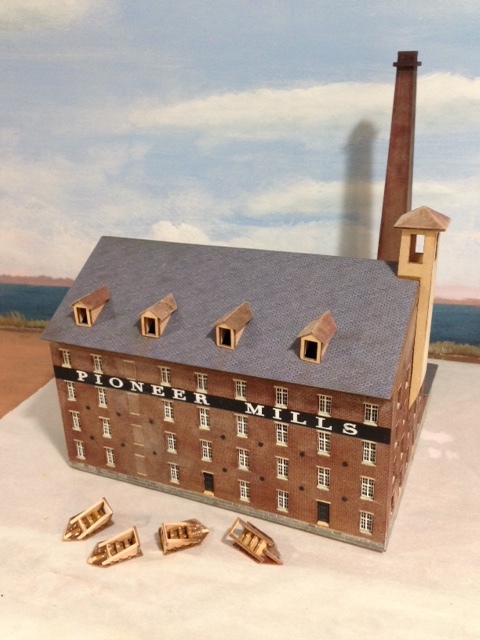 The model of the Pioneer Mills is almost done. It just needs gutters, skylights, and eaves. 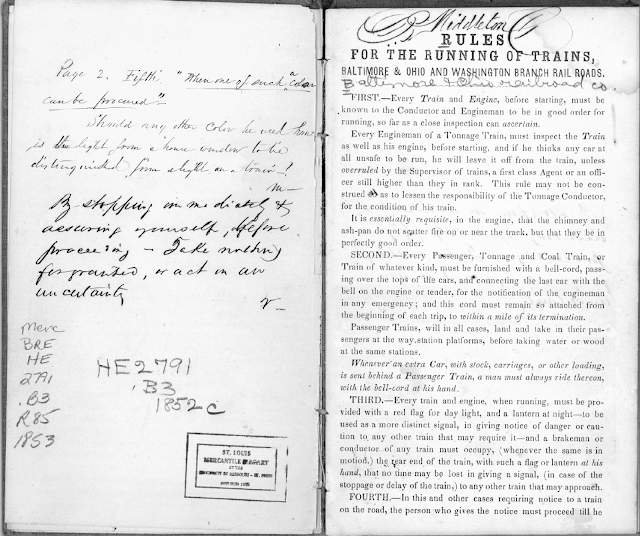 Then it is on to the Virginia Locomotive & Car Works, wharf, marine leg, and boat. I have been working on a model of Pioneer Mills the past few weeks. This is part of a larger diorama I am building for the Alexandria Lyceum. The diorama will depict part of the industrial heritage of Alexandria in 1855 before the civil war. It focuses on one waterfront block from Duke to Wolfe Street. 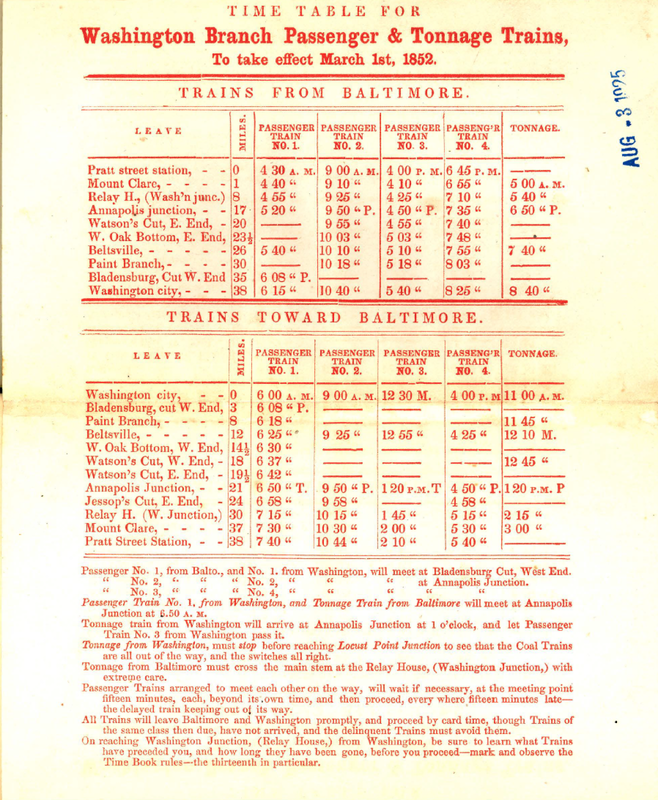 As such it features Pioneer Mills and Virginia Locomotive and Car Works. I have blogged about Alexandria in the Civil War several times before such as here and here. These buildings were still standing during the Civil War, but were used by the US Army for storage and other purposes. This diorama shows the period before the war when the loco factory and mill were in operation as civilian business. This diorama will be in built in N Scale as a static model. The photo at the left shows the model of Pioneer Mills as a work in progress. I'll post more photos as the project nears completion. 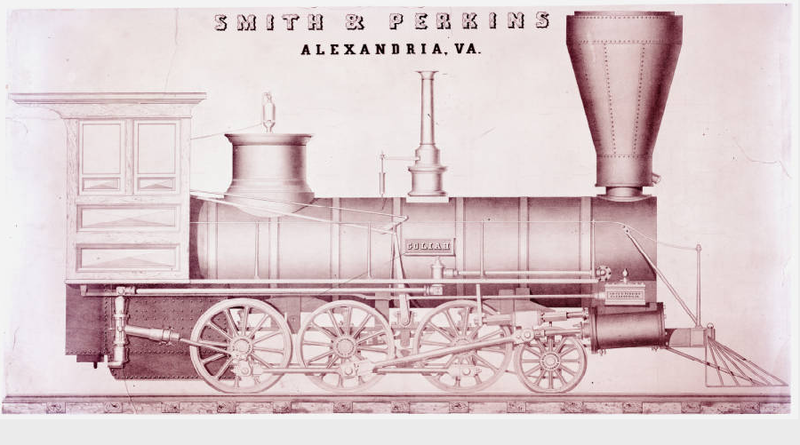 In the meantime, I am looking for more information about the Virginia Locomotive and Car Works. Other that the Birds Eye image of Alexandria (see above), I have seen no photos of this facility. This website has some historical information. Here is an image from the SMU archives of one of the locos they built. The 4-4-0 Virginia in my blog's side bar was also built by them. 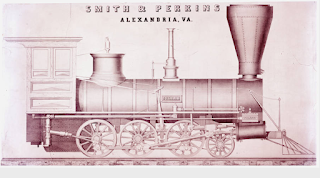 If you know of any further information about Virginia Locomotive and Car Works that could aid in building the model, please pass it on. I have a bunch of projects going on simultaneously right now - museum projects, client models, new kits for Alkem Scale Models, work on finishing Brooke on home layout, and the new book. Today the backdrop for the Harbor Project Layout moved to the front burner. Since my last post on the Harbor Project Layout for the book a few things have changed. I had planned to model Beaumont TX, but I had to drop that idea because I didn't have enough photos to illustrate a feature project. The new layout theme is set along the East Basin of the Port of Los Angeles. I made a rail fan trip there last year and got lots and lots of great pictures. It is also a really neat place to model. 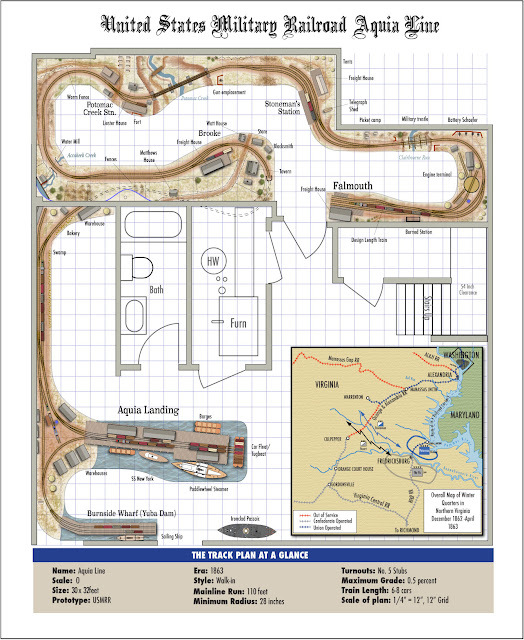 More specifically, the track plan is based on the Fries Ave area on Mormon Island, Wilmington, CA with some additional features from nearby areas to add a bit more more activity to the layout. 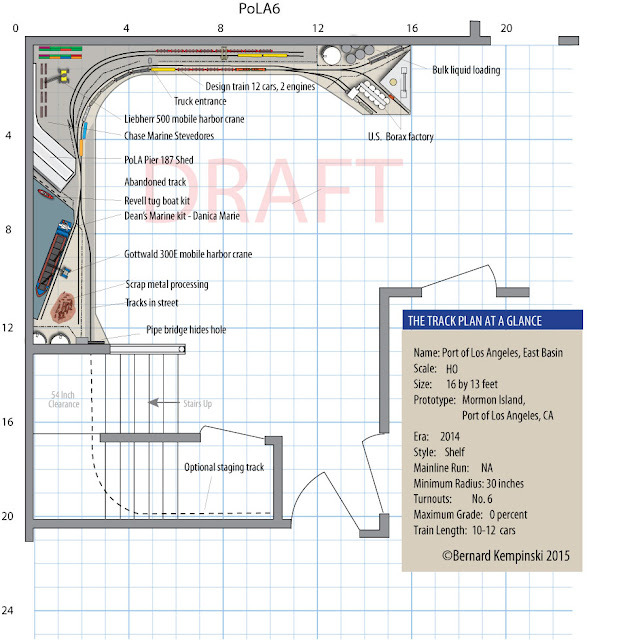 The image below shows the current draft of the plan. Now that I have a detailed track plan, I need to get the backdrop printed. Once the benchwork and backdrop are up, the track and buildings will be sited in their final locations to match the backdrop. Using the plan as a guide I made a large photo mural of the backdrop in Photoshop CS5.1. The base image is 57,000 pixels wide. Thank goodness for my Retina 5K iMac (3.5Ghz, 16GB RAM) as it handles the file without any problem. This image sample here has been scaled to about 5 percent actual size. The total image is 32 feet long. If all goes well, this mural will be printed in two 18-inch high by 16-feet sections. The mural utilizes about a dozen images composited together over a synthetic blue sky. The features on the backdrop, such as cranes, buildings, oil tanks, etc, are roughly where they would be in the prototype. I paid careful attention to the area with open water to match the track plan. I also tried to get the perspective lines to point to the corners. This should be fun to see how it works out. My brother visited today and he thought that the hidden staging track in the closet was a very worthwhile addition. So I need to make sure the benchwork is the right height to clear the stair landing at 54 inches. I am preparing to run the final section of telegraph line (scenic only, not functional) on my layout.. Since I have a tunnel that was not on the prototype, I wondered how they would have run the telegraph line. Would they run through the tunnel or over the nearby hill? On the Aquia Line the telegraph line was installed by the U.S. Army Signal Corps and not the railroad. 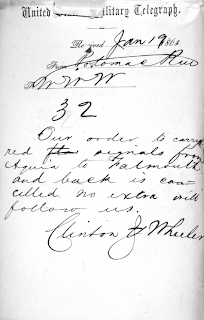 I suspect the Signal Corps had other military, non-railroad related, factors to consider when laying the lines. So they would not have necessarily followed the railroad. However, photos of the Aquia Line do show a telegraph line paralleling the tracks in the Stoneman’s Station area (see image above). 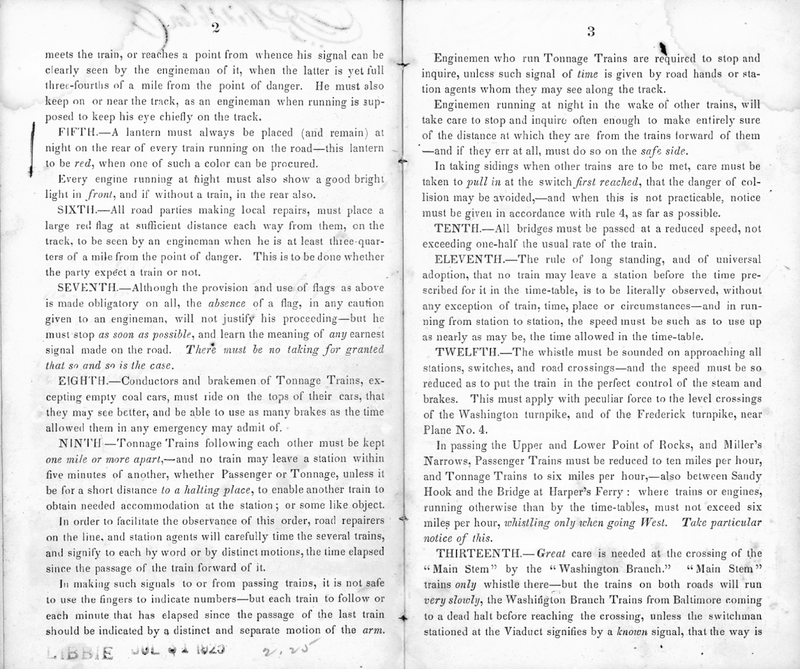 Since the units of the Army of the Potomac were deployed primarily along the railroad right of way, it is reasonable that the telegraph wire would follow it. 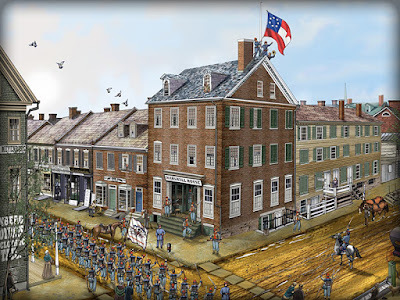 But the Army of the Potomac Headquarters at this time was not near the railroad. It was at White Oak, a few miles east of the railroad. 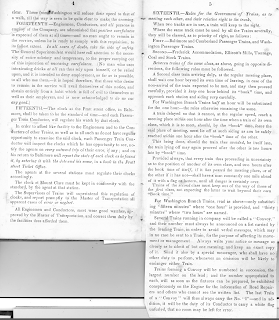 Reports state that the Headquarters did have a telegraph office, so at least one line was sent over land away from the railroad. The Army Signal Corps was mobile (see wagon at left) and could lay lines over land as the campaigns progressed. I posed this question to the Civil War Railroad Historical Society Yahoo Group. The consensus there was mixed with people suggesting that either case was possible. My tunnel is based on Crozet Tunnel on the Virginia Central. 19th Century photos of that tunnel show the telegraph lines going over land. Thus, I will run my lines over land. 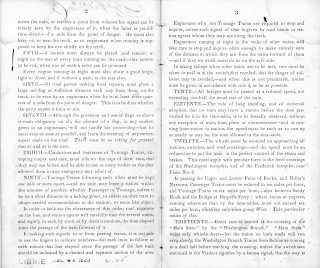 With regard to telegraph lines at Aquia, perhaps the more interesting line was the “submarine cable” from Aquia to Washington. 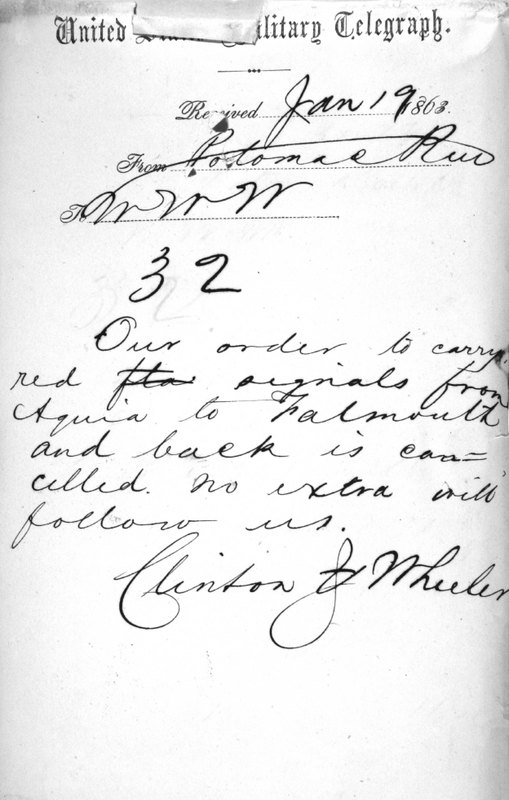 That allowed rapid communication between the Army and the War Department. I suspect that the train orders on file at the National Archives are actually copies transcribed by operators at the War Department as they listened in to the Aquia Line traffic. Depicting the submarine cable on the layout will be really simple! 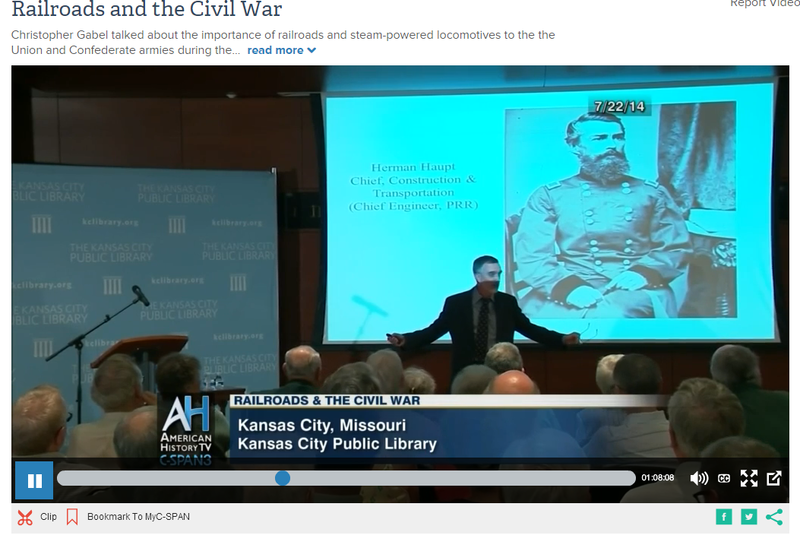 I recently came across this CSPAN talk by Professor Gabel on railroads in the Civil War. If you have read his work, you will be familiar with his message, but this talk shows some evolution in his thoughts from his earlier papers. 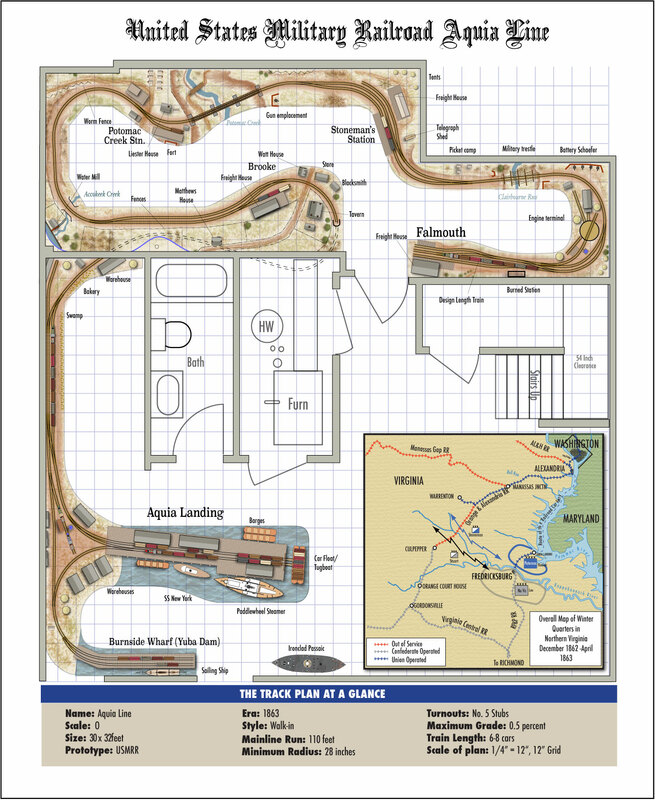 I updated the track plan for my home layout to reflect the as-built configuration for the areas that are complete and to revise the design of the portions in Aquia Landing that have yet to be built. While I was at it, I revised the graphics to incorporate the improved techniques that I adopted for my next book. The big change in Aquia Landing was to remove one of the yard tracks between the bakery area and the wharf. I did this because the layout really didn't need a third track there and this more closely resembles the prototype. I also reconfigured the wharf to better reflect the prototype. This required removing the ironclad from the layout. Note that this drawing depicts the track and ties to scale (the ties are not exact but they are close). One of the aspects I find with track plans that show tracks with just a single line is that it is easy to draw in too many tracks for an area. When you draw the track showing the rail, ties and roadbed to scale you get a much better feel for how the track fits in the scene. It is usually impractical to draw in the ties and rail in room-sized HO or N scale plans. But for my O Scale layout, drawing the tracks this way helped convince me that I did not need that third yard track. Mocking up he scene convinced me. The plan shows design length trains and four dozen freight cars as they might actually appear during an op session. Note there are only 5 engines on the layout. I may have the only layout where I have more radio throttles than locomotives. Since I have about 13 freight cars now, I still need to build about 35. Readers of this blog will know I am very interested in realistic backdrop (back scene for our UK readers) painting. I recently came across this blog, Matte Shot dedicated to matte painting for cinema. There is not a lot of instruction on the site, but it included hundreds of samples of matte painting for films. Some you will recognize from your favorite movies. Matte painting for the movie "Winds of War"
What I found interesting is that many of the matte paintings on display at the site were not "photo realistic." Apparently they just need to look good enough for the quick views that one gets in a movie. I recommend taking a look at the site. You might get some good ideas for painting or photo compositing your own backdrops. With most special effects now done with Computer Graphic Images (CGI), traditional cinema matte painting is becoming a lost art. 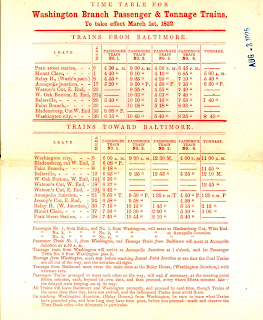 Last month I posted some information about a pre-ACW Timetable for the B&O Railroad. In that post I cited the B&O Book of Rules, a book I did not have. 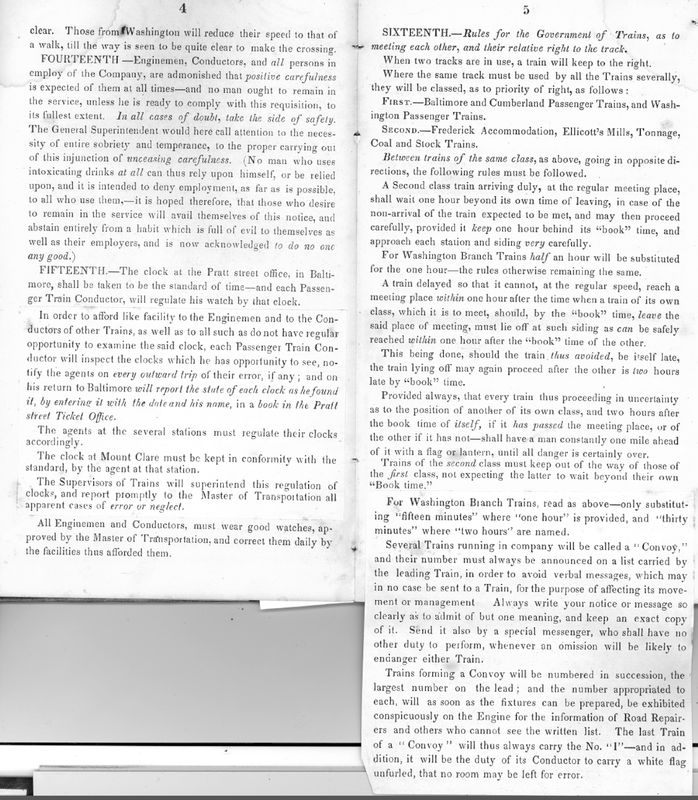 Nicholas Fry, of the Barriger National Railroad Library, saw that post and sent me a copy of the B&O book of rules from 1852. Many thanks to he and Henry Freeman, who facilitated the transfer of the book to me. Here are some pages from the book. The book has a total of 21 pages with about 10 relating to rules, the rest time tables and other interesting data. I need to study these in more detail. In some ways this kind of information, combined with the nearness of the B&O Museum, makes me wish I had chosen the B&O as my Civil War era prototype subject. 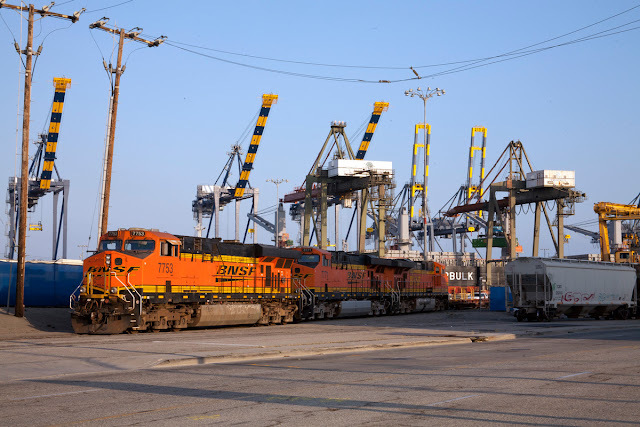 But life is full of tough choices and I am happy with my decision to model the USMRR. Having lived in this area for over 30 years I have adopted Alexandria as my home. It has a rich history dating before the American revolution. I enjoy visiting its historic homes, walking down the cobblestones of Union Street admiring the colonial warehouses, looking for rails in the streets that served now abandoned industries, and visiting its civil war sites. I am actively involved with local museums building models to help visualize it history. I have artist's proof number 1 of this print. Amid all this amazing history there is one travesty, and that is the plaque on the front of the Monaco Hotel, the building that now stands on the site of the Marshall House. The Daughters of the Confederacy erected the plaque in an attempt to memorialize the man that shot and killed the first Union soldier in the war. The victim was Lt Ellsworth, a Union officer. The plaque claims that the shooter died defending his property. If you knew nothing about that incident, which most visiting tourists don't, you would have no idea what really happened and why the murderer died. "...For some anxious Unionists, that flag was becoming a symbol of the administration's slowness to move against the gathering forces of the Confederacy. On May 24, 1861 (the day after Virginia's secession was ratified by referendum), with an order that came a day prior, Ellsworth found himself and his troops victorious in the face of a retreating confederate army in Alexandria. And on this day, Ellsworth would cut down the banner that he had seen countless times from the other side of the river. On May 24, Ellsworth led the 11th New York across the Potomac and into the streets of Alexandria uncontested. He detached some men to take the railroad station while he led others to secure the telegraph office. On his way there, Ellsworth turned a corner and came face to face with the Marshall House Inn, atop of which the banner was still flying. He ordered a company of infantry as reinforcements and continued on his way to the telegraph office. But suddenly, Ellsworth changed his mind, turned around, and went up the steps of the Marshall House. He entered the house accompanied by seven men. Once inside, they found a "disheveled-looking man, only half dressed, who had apparently just gotten out of bed" and who informed them that he was a boarder, upon Ellsworth's demand to know what the Confederate flag was doing atop the hotel. Ellsworth and four men then went upstairs to cut down the flag. As Ellsworth came downstairs with the (very large) flag, the sleepy "boarder" who was actually the owner of the house and one of the most ardent of secessionists in Alexandria, James W. Jackson, killed Ellsworth with a shotgun blast to the chest. Corporal Francis E. Brownell, of Troy, New York, immediately stabbed Jackson with the bayonet on the end of his gun. Brownell was later awarded a Medal of Honor for his actions." Now, the Alexandria City government is finally taking action to correct this historical distortion. The nation's recent wave of introspection to examine how many of its citizens view the the civil war has led Alexandria to reexamine many of its monuments and traditions. See this Washington Post article for more information. I find it a bittersweet irony that the actions of a lunatic racist murdering nine people in South Carolina would result in a long overdue look at the Civil War and its causes. For more information about this issue I recommend Professor David Blight's book, "Race and Reunion." It is an exhaustively thorough look at how views on the cause of the civil war evolved over time. If you don't have time for this extensive book, check out Professor's Blight's youtube lecture on the subject.